On November 6, the Shimajiman Soraben Festival kicked off at Nagasaki Airport in Omura, Nagasaki Prefecture, where "soraben" are being shipped in by air from the prefecture's outlying islands of Iki, Tsushima and the Goto Islands. 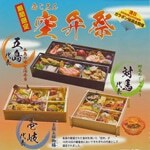 Soraben means “sky bento,” and a bento is a type of portable boxed meal common in Japan. During the event, limited supplies of local specialties and fine cuisine from the islands are being sold. Each of the locations is preparing 20 meals per day that are carried to Nagasaki Airport on Oriental Air Bridge Co., Ltd. (ORC) planes. "Ikikoku Otogozen" from Iki and "Tsushima no Gottsuo" from Tsushima go on sale at 10:30 a.m. each day, while "Gotono Aji Kukai Bento" from the Goto Islands go on sale at 11:30 a.m. All are priced at 2,000 yen. The booths also sell "Fine Sea Urchin" (1,500 yen, for the first 50 customers only) along with specialties from the islands. Sales cease when flights are canceled due to storms or other reasons. The sales are part of the Emergency Employment Creation Project, which, according to an official from the prefecture's government, aims to boost consumption of the islands' products and employment by using Nagasaki Airport's cargo space and its connections between the mainland and outlying islands to bring fresh bentos for the many people who come through the airport so they can "feel the taste and air of the islands." The Shimajiman Soraben Festival runs until January 31, 2011.